The conference, which is put on by both Longevity Warehouse and David Wolfe, has grown over the years but what I have learned is that at every event, attendees typically have a great time, arguable the best time ever. I say this because David Wolfe is know for saying, “It’s going to the best day ever” and even has a website called bestdayever.com. When he first said it, it seemed cheesy and untrue, but as the day went on and I kept hearing it aloud, I started to believe it. I was so inspired by the speakers, I met up with some great friends, met new ones, was surrounded by other people who love health as much as I do, and almost everyone had a smile on their face. It became the best day ever and I did not want to leave. It was hard to narrow my picks down from the conference but below are some I would definitely recommend for those who did not attend. One thing that I did take home with me is starting the day off by repeating David’s mantra, “It’s going to be the best day ever” and my days are certainly getting better. Thanks Longevity Conference. Hope to see you next year! Turmeric is known to be one of the healthiest foods on the planet but how do we get it into our diet? Many use Turmeric for cooking but sometimes I enjoy taking it by the dropper full to get my daily dose. Omica’s extract uses no flavorings, colors, fillers or artificial ingredients and is USDA certified organic. There is a high concentration of curcumin, which is high in antioxidants and has been shown to be anti-inflammatory and should be part of everyone’s daily regimen. 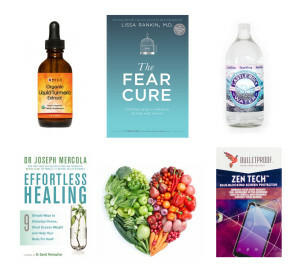 The Fear Cure by Lissa Rankin, M.D. Her talk at the conference was by far my favorite. Not that I did not enjoy the others, but she was incredibly bold and not afraid to be vulnerable up on that stage. What resonated most for me was this idea that every hardship is a chance for personal evolution and that loss is natural and leads to growth. I think that it is incredibly hard to understand those words of wisdom when we are going through tough times, but by facing the pain and moving through it, we come out so much stronger than we ever could have imagined. In her book she discusses how being afraid can make us sick, how to differentiate different kinds of fear, how to tune into our voice of courage, how to reshape our relationship with fear and what our fears can tell us about ourselves. This may bring a lot to the surface but hey, it sounds like a great opportunity for personal development. The water is well deserving of its epic name. The delicious and clean Castle Rock water was distributed and available to purchase throughout the entire weekend. Sourced from Mount Shasta, this water is naturally structured, filtered, pH balanced and free from artificial ingredients. On the website it says the water has undergone “100 years of natural filtration through layers of granite, gem infused rock, gold and green jade”. While water is one of the most contested topics, especially at an event like longevity, many health experts who were present were impressed with the quality of Castle Rock. I still have a lot to learn about water but I must say, you can really taste the different between this and LA city tap water. Admit it. We are all completely hooked to our devices. This Zen Tech screen helps to protect our eyes from the blue light that is typically emitted from LED screens. You can tell the difference when you have the Zen Tech on your screen or use a program like FLUX on your computer. According to an article on Harvard Health, the blue light not only throws off our sleep and circadian rhythms but it may contribute to “cancer, diabetes, heart disease and obesity”. You can learn more by clicking on the article link. However, I am all for protecting our sensitive eyes from the ominous blue light. This is not a product but was the overarching theme of David Wolfe’s talks throughout the weekend. He spoke about eating all the colors of the rainbow. We hear this saying frequently in the health community, but Wolfe really goes deep into what nutrition is locked in these pigments, which colors are good for certain parts of the body and what foods contain these valuable compounds. You can listen to a recent talk that David Wolfe did on this topic with Medicinal Foods here and get a taste of what he was talking about at the conference. Effortless Healing by Joseph Mercola, M.D. How many of us believe that ultimate health is our birthright? Dr. Mercola does and he also believes that we need to step out of the way and learn some basic tips about effortless healing to get there. Dr. Mercola advocates for staying away from GMO’s, eating too much sugar, refrain from carbs, meat laden with antibiotics, as well as other valuable health warnings. He says to spend more time out in the sun, to not sit too much, to drink clean water, to eat unlimited organic vegetables and to consume foods that contain probiotics to support a healthy micro biome. These were just some of the tips that he mentioned at his talk. Maybe applying these tips are not exactly “effortless”, but there is much healing that needs to take place in our country and in my opinion, his book is good place to start when looking for guidance.